Smelling the modern day drugstore version of Chantilly (by Dana, if I remember correctly) gives one a good idea what "smells like a cheap perfume" means (said in that certain tone and with a certain look on my mother's face). 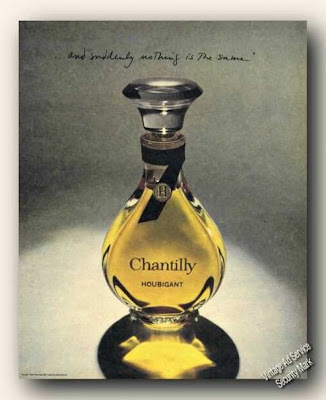 This was not what Houbigant, the original house that launched Chantilly in 1941 had in mind. 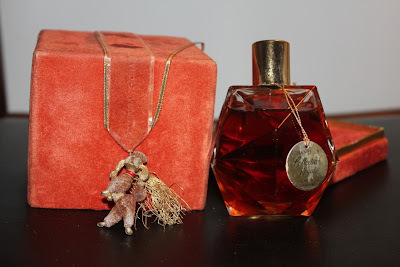 If you've smelled any of the vintage version (as long as they're marked "made in France" and are by Houbigant), you know it can be described as a plush floral. It's powdery, almost ridiculously frou-frou, has very clear notes of lilac, carnation and a sweet rose. The dry-down is a dusty leather-vanilla thing and calls to mind old and dignified European hotel rooms, with velvet curtains from floor to ceiling and thick wallpaper in a very elaborate design. I've played with vintage bottles and samples here and there for years but never owned one until I happened until the one you see above. 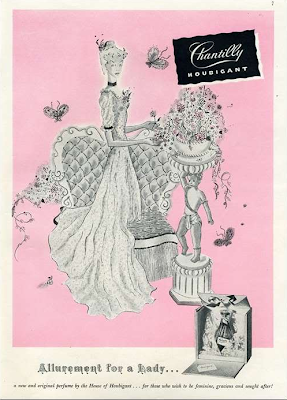 I've never seen or heard about this Chantilly Collection Royal, but it was sealed, made by Houbigant (and in France) and had this poodle charm. The cellophane wrap was falling apart and the velveteen box is getting bald patches (it was shedding in the plastic). 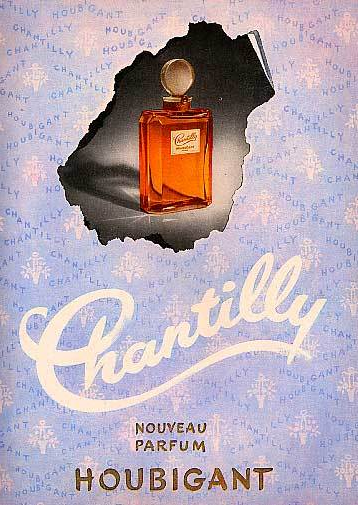 But the Chantilly perfume inside smells beautiful and is so soft and leathery that I grew to love it more than I expected. For rainy days spent on the couch..
Vintage Houbigant Chantilly ads from vintageadbrowser.com. Photo of poodle bottle by me. What a lucky find! I especially appreciate the little poodle charm.